Enhanced Abilities: Lord Mar-Vell has super human strength, agility, durability and endurance. Solar Energy Metabolism Lord Mar-Vell has ability to metabolize solar energy and convert it for a variety of uses including converting the light of the sun and stars and to a variety of different forms of light and energy. This allows him to fly (Potentially trans-light speeds), project Photon Energy Blasts (Powerful enough to destroy stars twice the size of earth), move at super speed, cast illusions and is virtually invulnerable. Teleportation: Lord Mar-Vell is able to teleport. Cosmic Awareness: Lord Mar-Vell is aware of anything that affects him on a universal scale, including threats, anything that would affect him in any way or even somebody talking about him. Immortality: Lord Mar-Vell is functionally immortal and cannot be killed by conventional means, thanks to the entity “Death” dying in his universe. 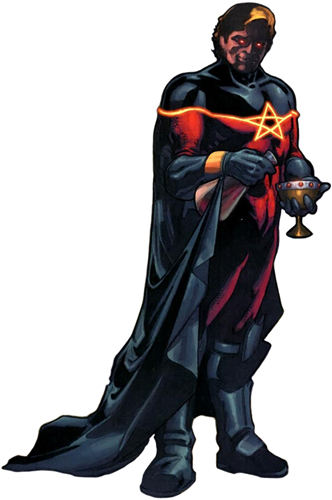 Lord Mar-Vell, as he is known, is the ruler of The Cancerverse and the voice of The Many-Angled Ones. In his reality, The Many-Angled Ones had already begun encroaching upon their universe but could not enter until a rift in the firmament could be promptly torn open. A rift, which turned out to be none other than Captain Mar-Vell, a Kree hero who was dying of Cancer or "The Black Death" as it was known on their world. As Mar-Vell slipped further and further into Death's hands and the empathic distress of all who loved and worshiped him grew, something dark, twisted and foul called out to Mar-Vell from the abyss. It appealed to Mar-Vell's desire to live and showed him a simple truth, "Even Death May Die". Too weak to realize that he was being fooled, Mar-Vell listened to the entities words as if they were gospel from above and learned of a ritual called The Necropsy. Mar-Vell was transfigured by these words and by those who spoke to him from the never-there and, on his deathbed, asked those who had come to see him one last time to join hands with him. The Many-Angled Ones had their victory, by touching Mar-Vell's hands, all of his allies were transfigured into that which should never be just as Mar-Vell himself had been in secret. With their combined might they captured Thanos and performed The Necropsy, thus destroying Death and allowing The Many-Angled Ones to pour into The Cancerverse uncontested.